This year’s Student Innovation Challenge addressed the topic of of analyzing sensor data in the Sensor Web and generating higher level information products. Yao-Hsin Chiang, currently a masters student student at the Department of Civil Engineering, National Central University in Taiwan, worked on creating a framework for an intelligent fire and disaster prevention system in his project “A Real-time Intelligent Three-Dimensional Fire Management System Based on Sensor Web Service and 3D City Models Open Standards“. 52°North was particularly impressed with his technical approach, linking sensor web technologies with on-the-fly route calculations and 3D visualization techniques. His highly independent work on the implementation of the prototype was remarkable. We congratulate Yao-Hsin on his accomplishment! 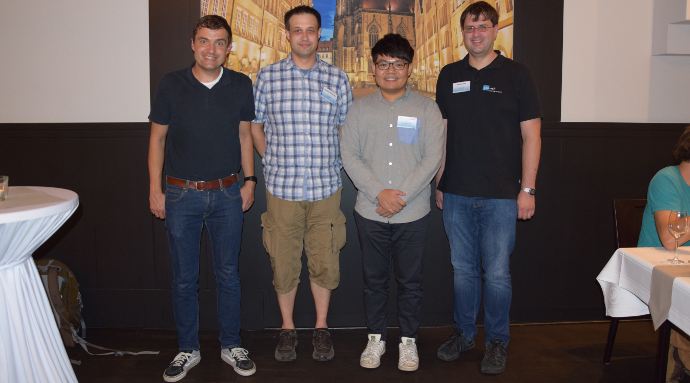 Yao-Hsin Chaing presented his project results at the Geospatial Sensor Webs Conference 2018 in Münster. His project code is available as Open Source on GitHub. More information about the project can be founde in his blog post. The 52°North Student Innovation Challenge stimulates students to generate and implement innovative ideas and concepts for a specific topic in the GeoIT domain. The challenge acknowledges and rewards creative and innovative minds.